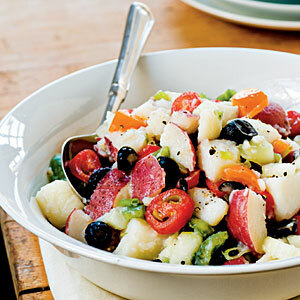 Many store bought Potato Salads are packed with carbs and unnecessary calories. Here is a great alternative that you can take to your next family gathering! 1. To prepare dressing, combine first 4 ingredients in a large bowl; stir with a whisk. 2. To prepare salad, place potato and 1/2 teaspoon salt in a medium saucepan. Cover with water to 2 inches above potato; bring to a boil. Reduce heat, and simmer 8 minutes or until tender; drain.